The image that the word tapestry tends to evoke in most people's minds is of rather heavy hangings that turn painterly images into textiles, either through part-weaving or through detailed stitching. The tapestries in this show are quite different from this traditional style in that they are light, airy and always abstract in concept. However, like earlier tapestries, they also have the capacity to transform bare walls with colour, form and texture, and can operate just as effectively in private as in public interiors. The origins of these fresh and entirely contemporary works lie in one of the oldest approaches to textile making in the world – that is the concept of 'strip-weaving' or 'narrow cloth' construction. The technique has been used world-wide and in most cultures, and some of the most fascinating of traditional textiles have been made by these means – such as Ghanaian kente cloths, Malian mud-cloths and traditional Japanese jackets and kimonos. Strip-weaving involves the production of yards of narrow cloth from about one to twelve inches wide. These are then cut into shorter lengths and joined to make wider fabrics. The origins of strip-weaving seem to have been essentially practical in that both large static looms and yarn are expensive commodities. Simple back-strap or narrow-strip looms were improvised from the cheapest materials, and narrow strip weaving also needs far less yarn, which could be bought or traded as needed. Once woven, the narrow strips can be combined by sewing along their edges to make larger widths, and the original strips can either be exploited in the designs or disguised by various dyeing or printing processes. However, in the present show, a heavy Swedish floor loom with a number of shafts has been used to weave the textiles – a necessary instrument for some of the more complicated weaving methods used. 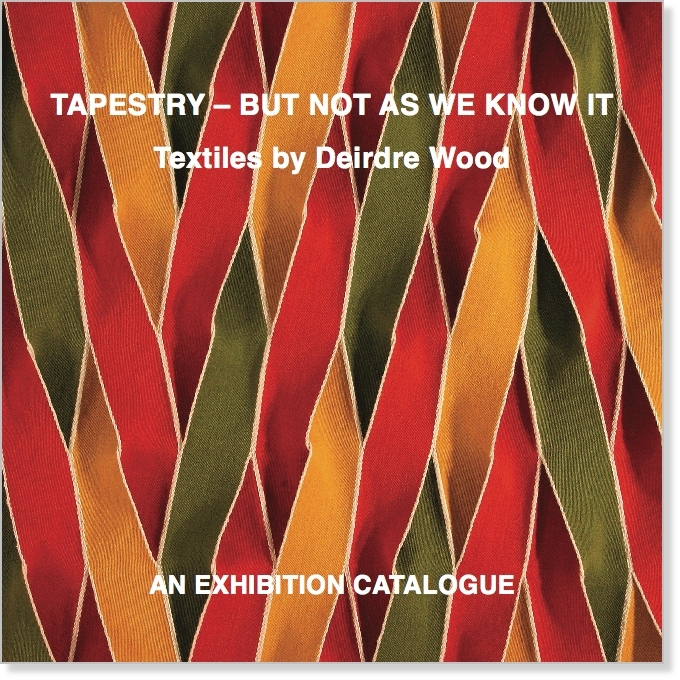 From her first exposure to traditional textiles, as a student at the West Surrey College of Art and Design, Farnham (1992–1995), Deirdre Wood has been fascinated by the strip weaving technique, and in 1995 she made this the basis for her degree show at Farnham. After leaving Farnham Deirdre was able to pursue this interest with a field trip to Mali in West Africa in 1996, when she lived in the remote Dogon village of Tireli on the Bandiagara Escarpment on the edge of the Sahara desert. Strip weaving is still widely practised in Mali where the narrow rolls of woven cotton once served as a local currency – and a currency that could easily be transformed into clothes when necessary. The trip was made possible by a Royal Society of Arts Bursary from a national design competition in textiles that Deirdre won when in her final year of her BA course in woven and printed textiles. It was also at Farnham that Deirdre first developed her ideas for twisting the narrow strips before sewing their edges together. In many of the works on display a third dimension has been added to traditional tapestry-making by this folding and twisting of some of the elements of the cloth, with many pieces showing subtle changes of form and colour as the viewer walks past. The technical processes and materials are not a category distinct and separate from the expression that the artist makes of them. On the contrary they are part and parcel of the meaning he can only express by endlessly studying their structure and the minutest subtleties of their behaviour: finding out what the material wants to say is the only way to say anything through the material. A further example of this openness to what the materials might want to do is seen in Deirdre's use of ikat – an ancient method for patterning textiles. lkat involves first making the warp (the long threads that will eventually run the full length of the loom and be wound onto the beam at the back) and then resisting these threads by binding them with cloth or raffia along certain parts of their length. The whole warp is then dyed, and the resisted parts stay uncoloured. When woven the dyed patterns become fixed within the cloth. In many of the textiles in this show the ikat method has been used, but it is noticeable that the regular bands of resist-dyed warp become gradually more disordered along the length of the cloth. This effect was originally accidental, but is now exploited quite deliberately for the special character that it provides. Its causes are quite subtle, and depend on the use of a warping frame, a tool that looks like a large picture frame but with thick wooden pegs projecting from it. As more and more warp-yarn is wound on to the frame the projecting pegs pull in slightly, making the warp lengths fractionally shorter as the frame fills up. This effect is later transferred to the ikat-dyed warp lengths as they are attached to the loom – minutely shifting the original evenness of the dyed-bars along the thirty-feet or so of the narrow-cloth length. This example of ‘geometry organically transgressed' (to use the painter William Hogarth's words) adds a pleasantly informal counterpoint to the more regular structures that are typical of fine weaving. Another instance of how traditional weaving methods have been adapted for these pieces is seen in Deirdre's use of the 'backed cloth' technique. This ancient process involves the use of two separate warps along the loom's length that merge at the point of weaving, but which can still be manipulated separately to bring one or other to the face of the cloth. Deirdre first used backed-cloth weaving because the process gave a thick and springy cloth that showed her twisting technique to the best advantage. However backed-cloth weaving also allows different colours to be used in the separate warps, to give entirely different colours, front and back. This provide dramatic contrasts to the main textiles, as the cloth is twisted or made to return on itself. If some patterns are also introduced to one or to both of the two warps the contrast between back and front may be even more dramatic. The backed cloth weaving process tends to make the warp the most visible element in the textile, while the weft (the yarn woven backwards and forwards by the weaver's shuttle) is almost invisible – although far from negligible as the various yarn-types used for the weft contribute much to the hang and to the subjective 'feel' of the cloth. Even so, the dominance of the warp threads in these hangings is another major difference from traditional tapestry, where the weft threads tends to be the more important element and supply tapestry's familiar 'weft-faced' structure. Narrow strip weaving also gives the opportunity to make full play of what are known as selvedges. These are the long edges of the woven strips that are traditionally reinforced with extra warp threads to make them stronger in weaving and in use. In many textiles in the exhibition this practical detail has been emphasised and enhanced by deepening and patterning the narrow-strip edges. This helps to accentuate the character of the strip-weaving process, and to highlight and enhance the joinings and the twistings that occur within the constructions. A very obvious feature of this body of work is the range and density of colour used for the pieces, and all the dyes have been prepared, mixed and applied by the artist herself. Deirdre developed her yarn-dyeing skills while a student at Farnham, particularly through an exhaustive process called triaxial blending that explored the interactions of three primary dyecolours. An extra complication to textile dyeing is the way in which different types of yarn respond to the dyes, and, considerable expertise and experience are needed to realise the colours that exist in the maker's mind. Rather less obvious than colour, but still vital to the success of the work, are the different types of yarn used in the weaving. In the present show these are all based on natural fibres: two animal (silk and wool) and two vegetable (cotton and linen). In only one of the pieces has a single type of yarn been used for both warp and weft, namely unbleached cotton. In all other examples the weft might be wool, silk or cotton, but with another yarn (or sometimes yarns) acting as the warp. In terms of appearance the warp threads always dominate in these textiles and supply their surface qualities. For example the grey and blue triangle shows the smooth surface of linen combined with silk, while the large red green and yellow construction has the warmth and richness of Cheviot wool. The pure lustre of silk is also exploited in a couple of examples. In terms of influences, my first training was as a student of ceramics at Farnham in the late 1960s, and later as a potter in my husband's workshop. I believe that these experiences exposed me to the exciting possibilities of three-dimensional form, and also to the broad and abstract decorations that could be integrated within the making process. I also studied basket making – in some ways a craft that is half way between ceramics and weaving – and I feel that this too has played a part in the development of my ideas. However, I do believe that some of my greatest influences have been the textile materials and the textile techniques themselves. Although ceramics and basket making may have played some formative roles in Deirdre Wood's work, these hangings are unusually pure examples of textile art. Indeed it is hard to imagine how their very special qualities of form, colour and texture could have arisen, or have been developed, in any other material.